This meal was SO simple and delicious. I had never used Philadelphia Cooking Creme before, but oh my gosh…that stuff is ssssooo good! I pulled off the “keep fresh seal” from the tub of creme and then licked it clean! That’s how good it was. 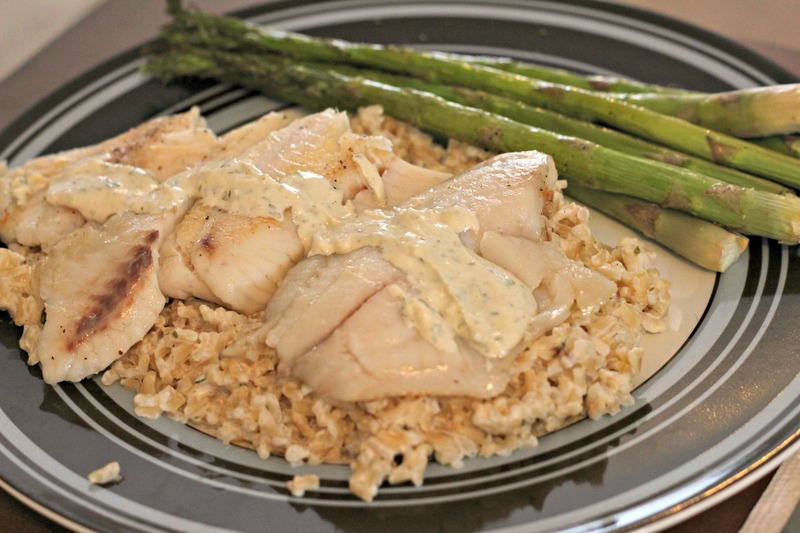 And because this creme is so flavorful and rich, you don’t need to add much else to the fish to get a really tasty meal. The recipe calls for Tomato Basil flavored cooking creme. While I’m sure that would’ve been delicious, my store was out of the flavor. So instead I got the Italian Cheese and Herb flavor. You can definitely choose whichever flavor you want! In fact, you could just keep making this same dish with different flavors of cooking creme, and it would be like a whole new dish each time. I might do that…. Heat oil in a large skillet over med heat. Add fish; sprinkle with pepper. Cook 3 min each side or until fish flakes easily with a fork. Remove from skillet; keep warm. Add cooking crème to skillet. Cook & stir 3-4 min. Remove ⅛ c crème; set aside. Stir peas & rice into skillet; cook 3-4 min. Serve fish over rice. Top with reserved ⅛ c crème.